There are many life lessons in nature but sadly modern society and man’s arrogance often leads us to neglect simple instruction. The laws of sowing and reaping, getting your hands dirty and adding time; waiting and then waiting some more for a successful outcome in growing and rearing food is a good analogy for life in general. These days we don’t always get it but despite our love of instant gratification, clever and fast computerised solutions and our insistence of having something ‘NOW’, Nature has refused to bow down. She ignores our tantrums and foot stomping and regardless of how fast we want something, she has remained beautifully consistent. If we want real and authentic over artificial and synthetic, there is only one way; there is no compromise. 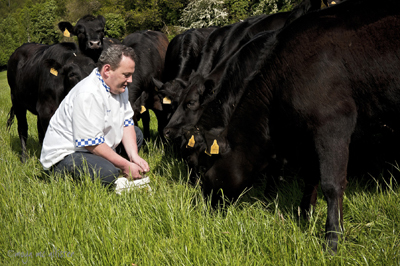 I am in this reflective state as I have just returned from my daily routine check of my herd of Whelan Wagyu. It is a project that has become a passion and obsession and has taken almost two years of my life. It will reach fruition in the coming weeks, midsummer, when I will finally bring Whelan Wagyu to my customers and let them decide if this has all been worth it. It has been quite the rollercoaster; at times exhausting, in the early days concerning but ultimately exciting. The story started when I discovered Wagyu beef on a visit to Japan some years ago. Wagyu beef, sometimes referred to as Kobe beef, is an international phenomenon. The reasons are manifold. Wagyu meat is striking because of its wonderful marbling which results in a never-before-experienced succulence that sends the taste buds reeling. The even better news is that the fat in the meat has more monounsaturated fats and melts at room temperature. This makes Wagyu beef suitable as part of a lower cholesterol diet, yet the high degree of marbling adds an extraordinary depth of flavour which makes Wagyu beef a culinary delicacy. Effectively, what’s not to like? Having had the experience I returned home to Clonmel wanting to bring Wagyu to my shop and customers. However the idea of importing beef from Japan didn’t sit easily with my home grown, local food ethos. I believe in that as much today as I always have done. As a family business for over 40 years, it is without a doubt one of the reasons for our longevity. What doesn’t come from my own farm comes from farmers that I know personally. Being able to visit their farms and building relationships with them is an important pillar of what I do and who I am. This was not going to be possible with a supplier from Japan and that was before we even considered the ultimate monetary cost. I had to find another way. It started me on a road that was nothing short of a leap of faith. I put one foot in front of the other, going gently and tentatively in relative darkness at first and will admit that some people close to me said I was crazy. The research was extensive and exhaustive and the early days involved a little anxiety, but we did it. Eventually here in Tipperary I mixed pure Japanese Wagyu with my own Aberdeen Angus and eventually the first Whelan Wagyu babies were born. It was a tremendous moment on the journey, but successful conception and birth were just the first tentative steps. The road ahead still loomed and once again nature led the way with the defining ingredient being time. My childlike desire for the process to speed along was totally ignored and nature worked at her own, steady pace. So for the past twenty four months, bar reading them a bedtime story, the little Whelan Wagyu have been minded like diamonds. They have grown. I looked at them today and realised suddenly how close we are to the finish line; yes it is emotional. Of course the real result will not be revealed for several more weeks when the taste of Whelan Wagyu steaks will tell the real story. Two years invested and we are nearly there and, if they taste the way I believe they will, then this is just the beginning of Irish Wagyu for years into the future. It is a seed sown and hopefully a legacy I will leave. As you can imagine they represent a great deal to me, not least the lesson about time and patience. They are also a personal achievement and testament of how ideals and values can be preserved without compromising progress. Challenges are necessary to move us all forward, but compromise is a price I am unwilling to pay. There is always a way if you look for a way and in my case I finally found a way to Irish Wagyu. Whelan Wagyu will be available some time in July. You will treat it the same as you would any beef, there are no special cooking requirements so no need to be afraid of it. I can’t wait for my customers to try it and right now the clock is ticking. I’ll keep you posted. I have contacted you before trying to determine when your Wagyu beef would be available. I would really appreciate it if you could keep me informed so that I can place an order. Can you please give me a date for Wagyu delivery to Monkstown(Salt).